SECA Art Awardees: Top row- K.r.m. Mooney, Alicia McCarthy, Lindsey White; Bottom row- Sean McFarland, Liam Everett. Images courtesy of SFMOMA. 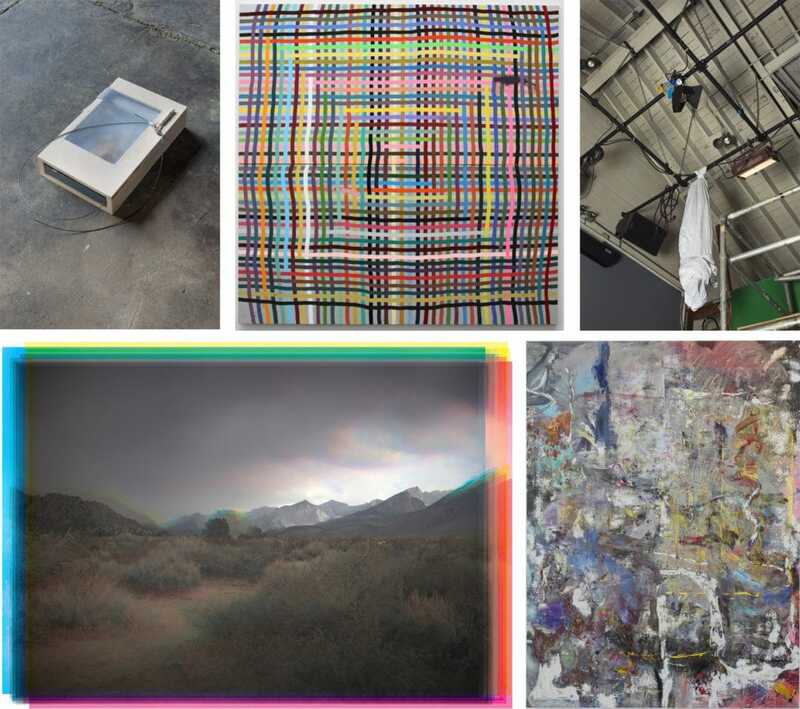 July 15th to September 17th – The 2017 SECA Art Award exhibition at SFMOMA: The 2017 SECA Art Award exhibition highlights five Bay Area artists, each with a dedicated gallery, in their first major museum presentations: Liam Everett, Alicia McCarthy, Sean McFarland, K.r.m. Mooney, and Lindsey White. Everett’s paintings reveal traces of their making, evidence of deliberate and repetitive actions focused on movement and materials. In her intricately patterned compositions, McCarthy transforms surfaces into bursts of line and vibrant color. Using made and found photographs, McFarland reckons with the challenges of representing the landscape. Mooney incorporates natural, industrial, and hand-crafted elements in sculptures that explore the relationships between bodies and objects. In her most recent work, White takes humor seriously, making photographs and sculptures inspired by stage performers such as comedians and magicians. 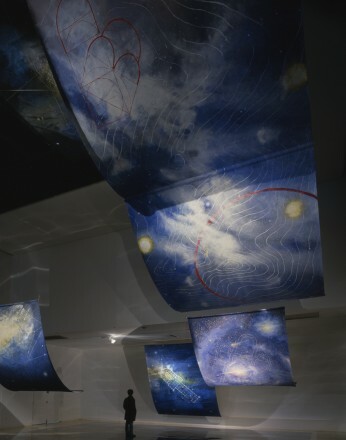 Installation view of “Our Love Will Still be There”. Image courtesy of Romer Young Gallery. Ongoing to July 29th – Chris Duncan: Our Love Will Still be There at Romer Young Gallery: Our Love Will Still be There combines a series of earth rubbings the artist made during a recent trip to Zion National Park as well as a series of long term sun exposures made in and on windows, skylights, and rooftops in Oakland and Los Angeles, California. The works are steeped in processes reliant on the passing of time and the effect of natural forces as primary mark making devices. Delicately layered with the artist’s own subtle interventions – hand-painting and sewn areas – the poetic works allude to historical aspects of painting and mark making, while at the same time, honoring the power and humbling nature of time, the sun, the wind and the rain. 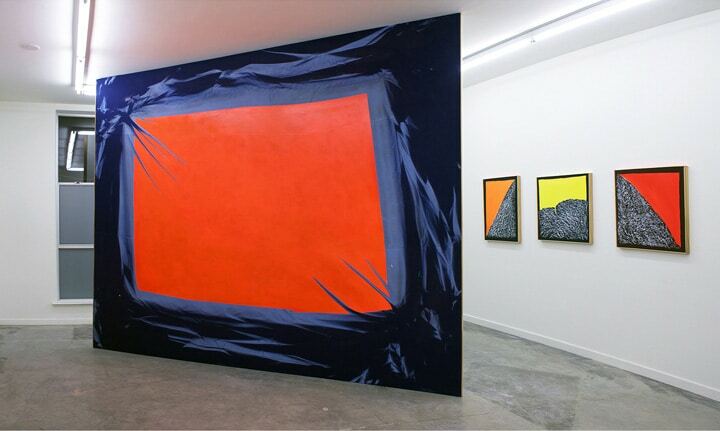 Romer Young Gallery is located at 1240 22nd Street, in San Francisco. 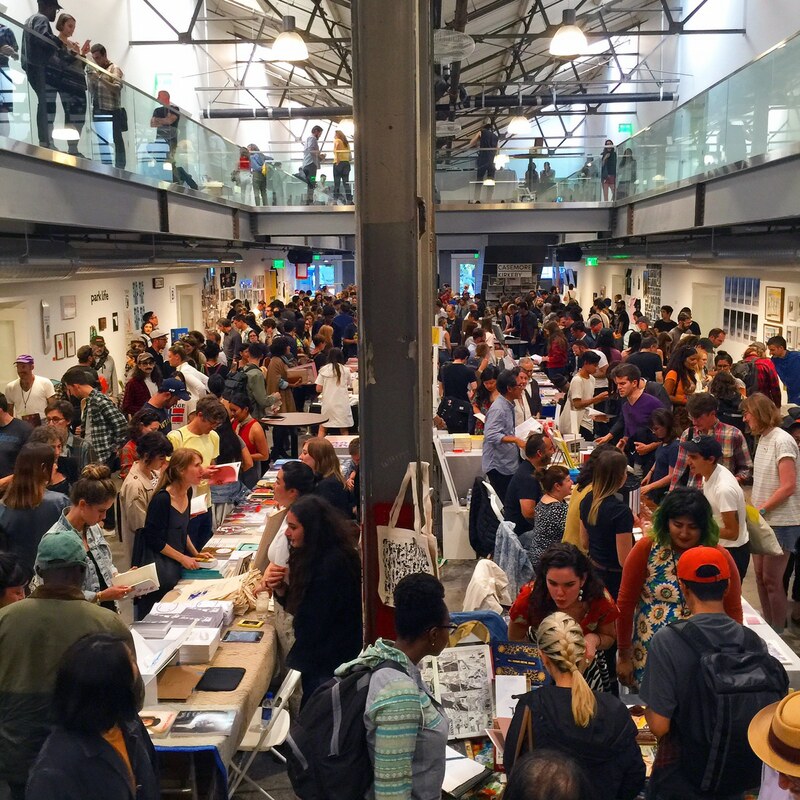 Last year’s SF Art Book Fair at Minnesota Street Project. Image courtesy of Minnesota Street Project. July 21st to 23rd – San Francisco Art Book Fair at Minnesota Street Project: This year, the expanded SFABF will occupy both floors of 1275 Minnesota Street, presenting over 100 exhibitors selling a unique selection of artists’ books, art catalogs, monographs, periodicals, zines, printed ephemera, and artists’ multiples. SFABF will feature a diverse range of talks, discussions, book launches, on and off-site special projects, exhibitions and book signings. For a complete list of exhibitors, check here. Hong Hao “Reflection No. 15”, 2016, oil, molding material on canvas. Image courtesy of Pace Palo Alto. Ongoing to August 20th – Form Through Narrative: New Chinese Art at Pace, Palo Alto: Form through Narrative is a survey of leading Chinese artists whose multi-generational practices explore themes of place, identity and tradition. For the contemporary Chinese artists in this exhibition, art is rooted in storytelling and the narratives surrounding their lives. Form through Narrative features recent works by artists who were educated in conventional, representational modes of picture-making but gradually abandoned them. While narrative becomes apparent in the process, background and content, the artists on view purposely departed from representational aesthetics to reach complete abstraction. Pace Palo Alto is located at 229 Hamilton Avenue. 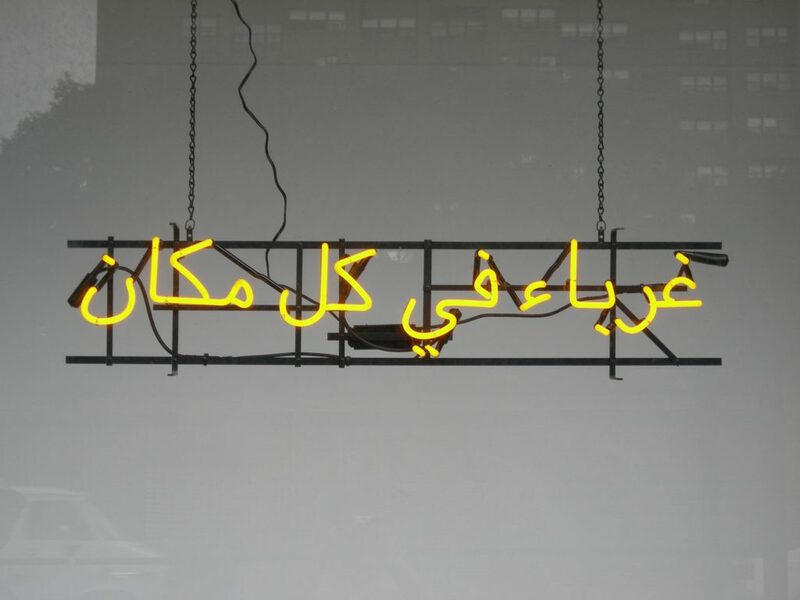 Claire Fontaine “Foreigners Everywhere (Arabic), 2005. Image courtesy of Kadist, SF. Ongoing to August 19th – What We Know That We Don’t Know exhibit at Kadist, SF: What We Know that We Don’t Know draws inspiration from poetic tendencies in Persian literature, where metaphor, irony, and paradox are understood as devices that allow artists to encode their opinions in complex cultural and political circumstances. In a cultural context, this is best illustrated through the concept of ta’arof, which designates a set of social behaviors defining how people should live in society and treat each other. A host is obliged, for example, to offer anything a guest might desire, while the visitor, in equal measure, is obliged to refuse it. Kadist, San Francisco is located at 3295 20th Street. Mar 28, 2012 In: To Do List Tags: Ann Hamilton, Betsabee Romero, Bruce Nauman, Charles LaBelle, Chris Duncan, Color, Emanuela Harris-Sintamarian, Lucrecia Troncoso, Margarita Cabrera, Oliver Ranch Foundation, Richard Serra, San Jose ICA, San Jose Museum of Art, site-specific installation, Sonoma Valley Museum of Art, Traywick Contemporary, Younhee Paik By: ArtSource Inc.
March 30 – September 23, 2012 Mexicanisimo Through Artists’ Eyes at the San Jose Museum of Art, 110 South Market Street, San Jose. 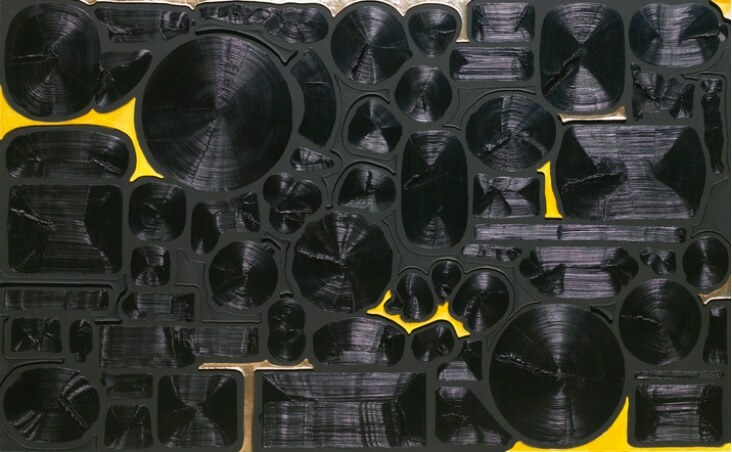 This exhibition features works by a new generation of Mexican and Mexican-American artists who are fascinated by traditional techniques, yet they create cutting-edge conceptual artwork. 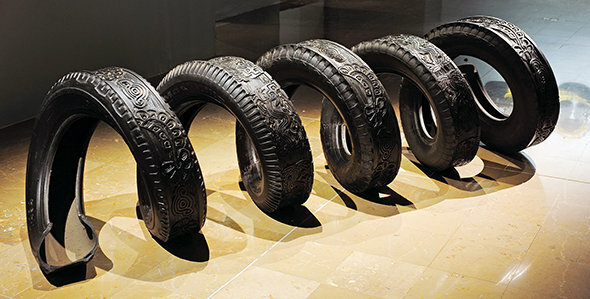 Mexico City-based artist Betsabee Romero carves tires with pre-Columbian icons and symbols in order to satirize Mexico’s machismo car culture. Margarita Cabrera’s series Arbol de la Vida combines issues of contemporary art practices, indigenous Mexican folk art and craft traditions and US-Mexico relations. The sculptures depict actual tools used on small farms in the agricultural communites throughout the United States. Dating back to the Olmec times, the traditional Mexican craft theme of Tree of Life embodies the tools with an assortment of ceramic birds, butterflies, flowers and leaves. 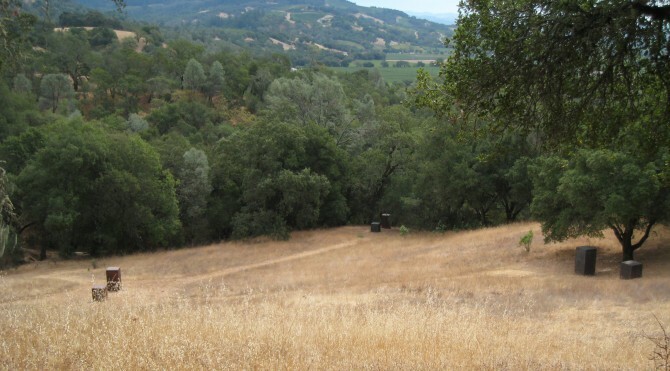 April 15th, 27th, 29th and on-going, Oliver Ranch Tours, Geyserville. 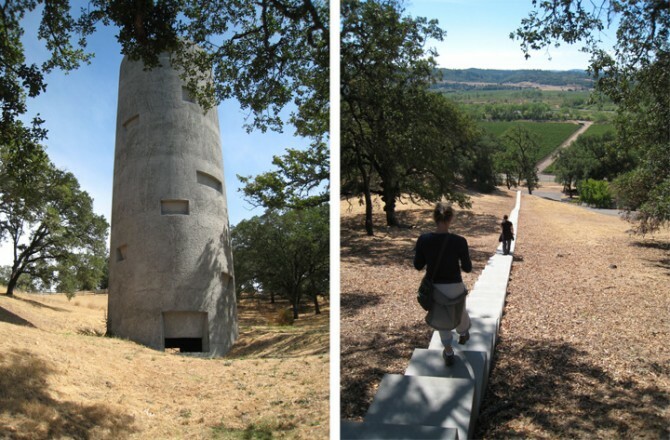 Located in the heart of Sonoma County, 70 miles north of San Francisco, the Oliver Ranch is home to 18 remarkable site-specific installations. The picturesque 100-acre property was originally bought by Steve and Nancy Oliver in 1981 to graze a few extra sheep from, as Steve says, “My daughter’s 4-H project gone bad.” The ranch’s evolution from exiled sheep quarters to world-renowned sculpture ranch was gradual and organic, a natural convergence of the Olivers’ longstanding passion for art and deep connection to the land. The Oliver Ranch Foundation now make tours available to non-profit organizations who can then offer the tour as an auction item or on a cost-per-ticket basis. You must purchase a ticket (from $75-$150) from one of the scheduled non-profit organizations listed on their tours page. The best part of the tour is that Steve Oliver leads it himself, describing the artist’s process as they respond to the land and create their site-specific piece. Ann Hamilton's cast concrete tower performance space. Walking down Bruce Nauman's cast concrete staircase. Ongoing through June 10th, Color Theory: The Use of Color in Contemporary Art, Sonoma Valley Museum of Art, 551 Broadway, Sonoma. This exhibit, guest curated by Katrina Traywick of Traywick Contemporary, celebrates and explores the meaning, usage and significance of color within the context of contemporary art. 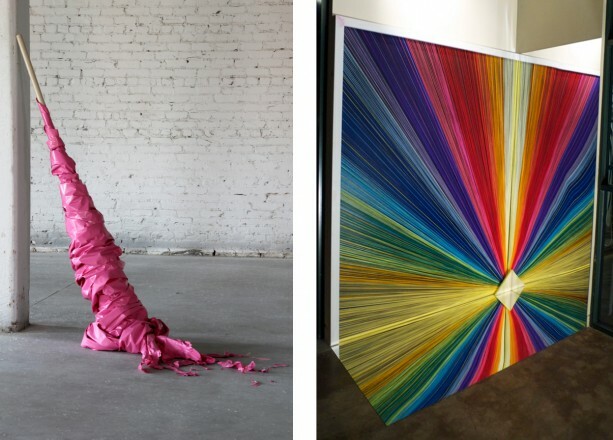 Employing non-traditional materials and processes, nine artists engage the foundations of color theory in ways that are entirely contemporary. The exhibition ultimately illustrates that color is not only to be seen, but also experienced. Lucrecia Troncoso, "Not MY Tongue Tied", plastic latex, cardboard, thumbtacks. Chris Duncan, "Cornered", string, wood and mirror. Images courtesy Traywick Contemporary.